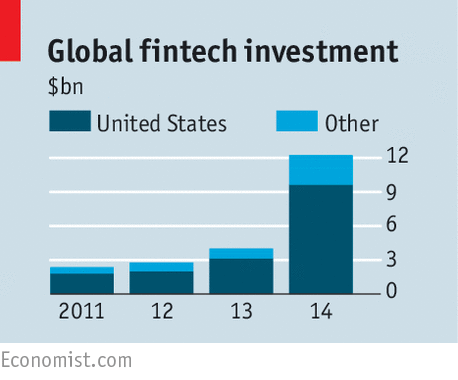 Fintech: are banks now panicking? Just a couple of years ago, P2P lending, cryptocurrencies and other financial innovations where not taken very seriously by the established banking sector. Things seem to be changing. A number of news over the past few weeks seem to demonstrate that many banks now fear that their traditional business model is about to get disrupted and that it is perhaps better to jump on the bandwagon. We never know. Especially when your decades-old IT systems show cracks all over the place. First, P2P lending and crowdfunding. Following a number of big name moves over the past few years (such as Lending Club hiring Morgan Stanley’s former CEO John Mack) and the IPO of Lending Club (currently valued at $6Bn, about a third of Commerzbank’s market capitalisation), what could be more symbolic than Goldman Sachs’s plan to launch its own platform? Whether or not it can succeed in attracting lenders (hard to say that you an ‘alternative’ lender/borrower attempting to disrupt finance if you use GS as a platform…), at least it can leverage its structured finance skills to securitise P2P loans and sell them to institutional investors the way I described 18 months ago. As Basel regulations that make it expensive to lend to SMEs are unlikely to disappear anytime soon, small firms are increasingly turning to those platforms, so growth is likely to remain healthy for the foreseeable future (and potentially lower the distortions and impacts of what I called the RWA-based Austrian business cycle). Second, cryptocurrencies. What was widely seen as an idealist libertarian scheme doomed to fail is now seen as almost inevitable. Everything is moving onto the (coloured) blockchain (payments, FX/securities transfers…) and bypassing the current centralised financial system. The job market in certain areas of finance will be gloomy over the next 15 years. Evidently, financiers would rather keep their job, so are trying to come up with their own proprietary solutions. Nasdaq, the US exchange, has announced its own blockchain initiative to “facilitate the issuance, transfer, and management of private company securities”. This could change some traders’ habits as described by the FT. Same thing, Citigroup is working on its own version, which would “allow for less complicated and less costly cross-border payments and other transactions.” As is Barclays. As is Santander. As are most financial institutions I’m aware of. Their incentive is clear: let’s not get disintermediated (or at least limit the damages), and if can capture additional revenues while lowering our cost base, all the better. Additionally, an FT writer reports that bitcoin (actually, the blockchain technology) could fundamentally simplify the back office/settlement process. As I said above, brace yourself for job losses. What would happen if the ownership of securities were recorded in a blockchain? We envisage two scenarios for the integration of this technology in the post trade world. The first scenario creates a total disruption. In its purest form, a distributed blockchain system allows all market participants direct access to the DSD (Decentralised Securities Depositary), to the exchange and to the post trade infrastructure (clearing & settlement). If this setup develops then existing industry players might be redundant. However, given the challenge of keeping the private key of the account safe, it is possible that investors will entrust an authority to safe keep the private keys. It is also possible that custodians will be responsible for the application layer over the blockchain or that they will launch their own network. The second scenario is an integration within the post trade ecosystem. The distributed ledger might only be the next generation of IT infrastructure. In this scenario custodians or settlement infrastructures might use the blockchain to record the ownership and trades between themselves; however end investors will still need to use a custodian to have access to the market. The ledger will only be accessible to authorised market participants. Existing actors will remain in charge in this scenario however their level of service could change and they may deploy new services that they could not in the past because the investments required were a huge barrier to entry. Even in emerging markets, telecommunication companies and banks now fight each other in a match that would have looked rather awkward just a decade or two ago. Equivalently, in developed markets, Apple Pay, Google, Paypal and others are starting to take on the banks. While the scope of their activities remains limited for the time being, they could do much more. My readers know that the heavy regulatory burden on the banking system is an enabler of this disruption. As regulatory costs jump into billions, you can deduct those from technology and financial IT investments. Regulators want banks to get safer but don’t really allow them to develop safer innovative processes as they try to harmonise business models (on top of regulatory costs). This leads to economic damages, as I regularly argue on this blog, but this provides fintech startups with a great opportunity. They should seize this chance and resist the urge to call for regulatory barriers to shut out new entrants. Only this way would financial markets and the economy remain distortion-free. PS: I had to point out the irony if this article in the FT by Mark Carney, the governor of the BoE. Carney argued that banks should not exclude vulnerable people in emerging markets. But, Mark, banks’ reactions are a natural consequence of the regulations opaque fines that you and most other regulators have been advocating for years now, despite bankers warnings that this would happen. A little late to think about the consequences of those rules, isn’t it?